That afternoon, we went to Arches National Park, too, and did a lot of hiking around. 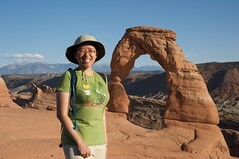 I finally got to do the Delicate Arch trail, which I'd wanted to do for quite some time. Arches is beautiful! I wish I could've spent a couple of days there. You guys seem to have had a blast :-) Thanks for the postcard!